We head south of Powell River on Highway 101. It’s hard to believe, but this is the northern extension of the same highway that passed our former home in California. A left turn at Dixon Road takes us off the pavement and onto Goat Lake Main. 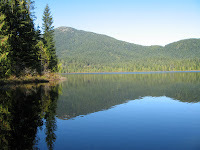 The main is a busy logging road on weekdays and has plenty of potholes, but is safe to travel with our large trailer in tow on weekends and holidays. We had our lunch at the lake and Wayne tried a few casts from the wobbly dock. 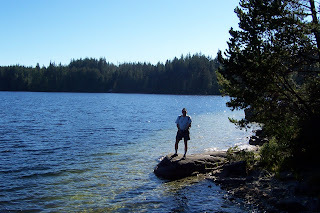 After leaving Lewis Lake, we took the narrow trail down to Spring Lake. 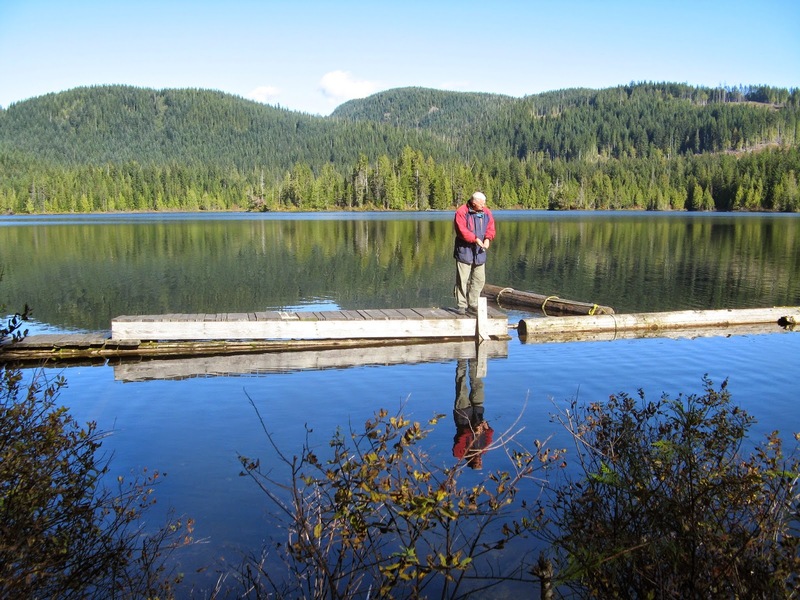 This lake is small and shallow, but there’s a beautiful view between the trees that shade the hand-built picnic area. The last part of the trail had a steep spot. This is exactly why I got my Yamaha Kodiak 450 with 4-wheel drive, but did I remember to turn it on? NO! After a little tipsy-turvy spell, I came to a stop facing a tree. I engaged my 4X4, backed easily onto the trail, and the rest of the way down. Back on Spring Lake Main we turned onto Giavanni (Giavanno on some maps) Main. 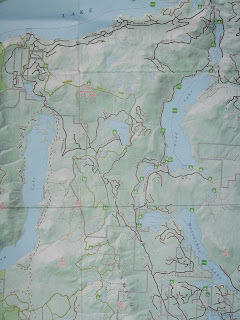 From its lofty track we could look down on the head of Haslam Lake (Powell River’s water supply) and then Giavanni Lake. This part of the ride was very familiar to me. 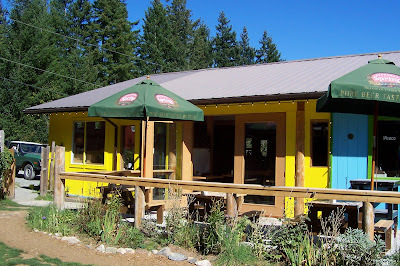 We popped out into the remains of Fiddlehead Farm (only a few apple trees now) and then onto Rainbow Main, skirting the southern edge of Powell and Goat Lakes. It's been a few years since there has been active logging along this section and the steep sides have grow over with alders and brush. That was good for me and my fear of heights ("Quad Acrophobia" in Up the Main). At the junction of Goat Lake Main, we headed back south towards the truck. 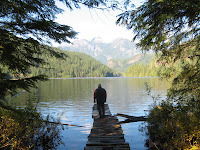 But first we made a short stop at the picnic area at the north end of Windsor Lake and then the Powell River Canoe Route portage at the north end of Dodd Lake. Time (and sunlight) was running out, so we made a dash down the main past Ireland and Nanton Lakes without stopping. Our trusty truck and trailer were waiting to receive us and take us past our final lake of the day, Lois Lake. If you watch the weather, you can usually find two days in a row to take a quick cruise on the Strait of Georgia. 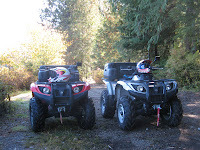 Wayne and I were able to squeeze in one such trip to Cortes Island. In September I told you about a cruise we took to Cortes with stops at Von Donop Inlet and Gorge Harbour. The destination for this second fall cruise was Cortes Bay. 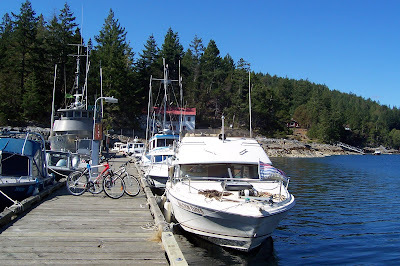 We again loaded our bicycles so that we could tour the island. When we arrived at the Cortes Bay government dock, we decided to tie up for the night rather than anchor. That's one big advantage of off-season cruising. Just after we arrived, a motorcyclist stopped and proceeded to walk down the dock looking at the boats. She was helping the harbour master and took our overnight fee. There is also an honor box at the top of the ramp. The road from Cortes Bay to Manson's Landing are pretty hilly. Even more so than on our previous trip. But the scenery was beautiful and the weather just right for pedaling. We exited the marina and turned left on Bartholomew Road. This road takes you all the way to Sutil Point Road. At this junction we weren't sure which way to turn for Manson's Landing. Wayne tried to flag down a driver, but he just thought we were waving. The second driver stopped and gave us directions, turn right. We were in luck today. 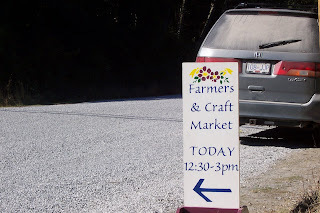 There was a farmer's market in progress at the community center, Manson's Hall. Even if there isn't a market in progress, this is a great place to stop. It's the meeting place for islanders with a post office and thrift store inside. After we ate lunch at the Sunset Restaurant we went across the street to the market and had homemade peach ice cream - YUM! Rather than head straight back, we continued on to Seaford Road until we reached Hague Lake. This is a great swimming spot. After a refreshing dip we retraced our path to the boat. Seaford Road will take you to Bartholomew, but it's a steeper route. Back at the Bayliner, we were ready for a quiet night on the dock. We were the only occupants other than working boats waiting for their captains. If you like solitude, its a great time to travel. September is usually a good month to fly north (or south) along Victor 27. Not so last week. 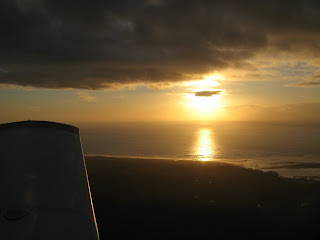 We had to time our departure from Cable Airport (KCCB) to slide between storms passing through the Pacific Northwest, dodging clouds all the way. We are IFR capable, but the low freezing level kept us in clear air. 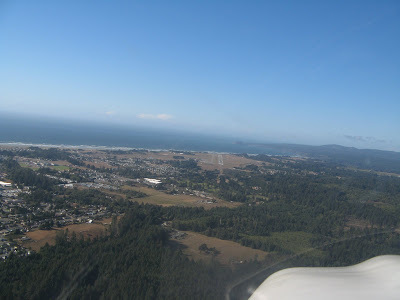 We stopped for fuel at Eureka/Arcata Airport (KACV) then pressed on to Siletz Bay Airport on the Oregon coast. We set up our tent, had dinner at the Side Door Cafe and settled in for a much needed rest. Even with George (our autopilot) back in operation, eight hours is a lot of flying for one day. As we slept, another storm hammered on our tent's roof. The next morning brought a low overcast with about 5 mile visibility underneath. We hopped from airport to airport, making a go/no go decision as we passed each one. 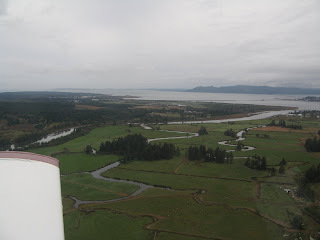 As we approached Astoria Airport (KAST) at the mouth of the Columbia River, the skies began to open up to welcome us. Astoria is an easy fuel stop with a self-serve pump. It has good IFR approaches and long runways. 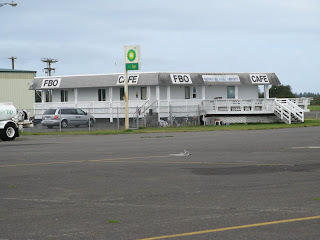 The Flight Service Station from the 80's now houses the airport's FBO. But, as of May 2009, the wonderful little Runway Cafe is no longer serving good eats and strong coffee for weary traveler. It's part of the sad times for general aviation in these tough economic times. Hopefully, when things get better, they and other wonderful little "100 dollar hamburger" spots will reopen so we can re-fuel our tummies as well as our tanks. Astoria is also a good overnight destination. We like the Shilo Inn (about 4 miles) for a quick stopover. When we want to get to town, we opt for the Red Lion on the city side of the bridge. From here you can walk the waterfront to several nice restaurants. Have a little more time and want to see the coast? You can rent a car with airport pickup and go to nearby Seaside. This quaint town has a nice Shilo Inn right on the water, restaurants and tourist shops. They have an airport of their own if you can handle a 2360' runway. So, whether you are looking for fuel, a good meal, a place to rest or sightseeing, stop over in Astoria, Oregon. Lewis and Clark new a good place when they saw it. Plus, it gets two wings up from us.